You can check out my schedule of classes on my StudioDax site. thank you for promptly mailing my bead crochet kit-but i cannot find the tutorial on your site-nice pictures-but no concrete info= please advise where?????? Hi Maya, I’m so sorry for the mix-up…. the tutorial is not on my site, it is a PDF file I send out directly thru email, and I sent it out to you on 10/13 when I got the order. Please check your emails (I sent it to the email provided by Paypal), and let me know that you got it ok – if not, I will resend to a different email if you need. Again – sorry for the mix-up!! Hi Julie, I get these wholesale in bulk for my classes, but I’m happy to work with you if you’d like some. Please contact me via email for more information and details! Thanks! Such beautiful words….bulk…..wholesale! I have a tax id number, can you hook me up with the company? Or, sell me about 50 ? I am so glad i bumped into your website! Glad to be of help… I sent a reply to you via email, if you need that kind of quantity, it’s easiest to deal with them direct – no need for m to play middleman! 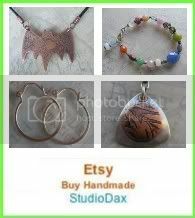 Thank you for such a wonderful tutorial.. i am a long time crafter who wants to branch out to metals.. TYVM !! Woman, This is just what I am looking for! Somehow I linked to your blog by way of Pintrest. I have just started making Jewlery and have gotten to the point I need help with the finishing touches to really make my “dear love ones” pop and here they are , but sadly it is 1am and I have to go to bed!!!! I will be looking forward to reading ALLLLL your blog in the weeks to come. THANK YOU SO MUCH. BIG HUGS from Colorado for the wisdom you have given. Thanks so much – I feel so guilty for not posting in so long (over a year! ), but my new store has just taken up all my time. I am thrilled that my blog has found a new life thru Pinetrest!! In case you get this after all these years… I’m in Annapolis and plan to reference several of your projects for use in the Jewelry Club we have at the Senior Center there. Looks like your “frog” FB page is going well. Sorry you stopped posted, just found your blog via Pinterest. You have so many great ideas and information posted! Thanks! BTW, I had to smile when I saw what a fan you are of DAX! John M. (Dax in the movie so long ago) is doing well, lives in my community and goes to my church! Is your new store on line? If so can you post a link? BTW congrats on the new store! Good things out, good things return! How do I order a beading jig? There are 2 options – the jig w/CD tutorial, and the kit version, which also includes the correct size crochet hook and needles. Hi im from Montréal Québec ans id love to bye a mandrel could you help me? I’m so sorry, but I no longer sell any of the mandrels, but many sellers on Etsy sell them. I’m so sorry that you have misplaced the CD. I have looked thru my records on my Etsy store to find you, but I am unable to find any orders with your name, this email, the town Hamlin, or your Zip (04785).. I know that people can change their names and emails, and they also move – can you please let me know what name, email, or address you used when you placed the order?? Please email me direct with the info, at randishome-web@yahoo.com . Not a problem – I found your order from 2011, and I am happy to send the instruction PDFs to your email. Please email me directly if you have any other issues… enjoy! Hi- first of all, thanks for tutorials. I feel strongly in the sharing of artistic knowledge, and some wrappers don’t seem to understand that no one is trying to “steal” their jewelry, and are tight lipped with well explained tutorials/videos. Plenty have taken painting classes, but had Van Gogh taught one, he wouldn’t have created more Van Gough’s (I’m trying to decide if I am embarrassingly spelling that wrong). I am having some uncertainty on buying wire. I am still working in copper, for price, and because silver finishes tend to wear while weaving. I enjoy all shades of copper wire, but I won’t use anything covered in plasticish material or a thin thin finish. I’m not crazy about the bright golden looking copper that always seems available in larger quantities in stores. I’d rather it look like a Med to old penny. I enjoy browns, greens– things that well, go with copper and red hair. I use 18-28 g half hard round. I’ve never welded or hammered. People using silver and silver plate all seem to go to Rio Grande, but they have far less copper than other metals and I don’t know if it is the right “kind”. I wish the colors I liked to use were also sold in bulk and I wish it all was the same color all the way through. I’m going to send a pic of my favorite earrings I’ve made, which is green is metallic but not too shiny “permanently colored Artistic Wire” from Hobby Lobby and the brown is a coated copper; shiny in gold in center, this pretty dark metallic brown outside. Where and what kind of copper wire can I buy in bulk? As far as colors; I want it all metal half hard just tell me what is either solid and colored or the best brands for long lasting color even when weaving. I need help! I’m glad you enjoy the tutorials… I don’t really post anything here anymore, but I am so happy that the blog is continuing to be helpful to folks! Unfortunately, I do not do any weaving – I am a sterling and copper kinda maker!! If you like the look of solid copper (not coated), you can buy it by the spool at hardware stores (or online thru hardware sites) for a very good price. I’ve been doing that or years – much better quality and price than buying copper wire that is made specifically for jewelry – but it is uncoated, and will oxidize/age (which I like). I am not amiliar enough with any of the coated wires, so I can’t help with that – so sorry! Love your site! Do you have a newsletter? Hello, I bought your jig, but can no longer locate the instructions to use it. It has been awhile since I used it and have forgotten. Could you email it to me again? I am unable to find your name/email in my records… can you please let me know if you had a different name/email back when you bought the jig? Thanks!